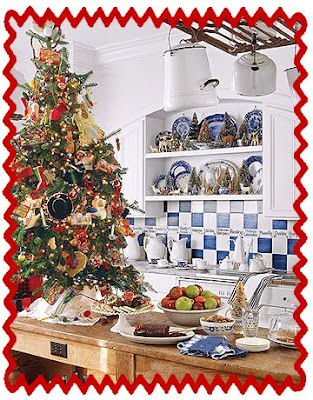 WHY NOT PUT A TREE IN YOUR KITCHEN? I don't know about you, but right about now and for the next few weeks, I'll be spending a good amount of time in my kitchen. Right now I'm starting to make the goodies that I'll be giving away as gifts. My specialty is chocolate covered popcorn. Everyone I give it to just loves it! It's become a tradition to give this gift every year. People start asking my daughter in November"Is your mom making her popcorn this year?" I guess I can't get out of it now. I can't believe I'm actually going to do this, but I going to give you my super secret, highly technical recipe. Microwave the white chocolate 1 lb at a time in a large pyrex cup at 60 sec intervals stirring in between until melted. DO NOT OVER COOK. White chocolate burns easily!! Pour 2lbs melted white chocolate over popcorn and mix thoroughly until completely coated. Let sit for one minute until heat is dispersed from melted chocolate, but do not let it start to harden. Add the M &M's. If you don't wait to let the chocolate cool, the M & M's will melt and smear, not good :( Keep stirring until M & M's bind with the popcorn. Spread out on cookie sheets. Melt in microwave, red and green chocolate in separate pyrex containers, making sure to microwave in increments and stirring in between. Remember white chocolate burns...so does red and green. (it's really colored white chocolate, in case you're wondering) Take a spoon in each container and drizzle each color over the top of the popcorn in random line patterns. When popcorn is hardened and"dry" break up and store in air tight container. If you are making large quantities, I store in clean(of course) tall kitchen trash bags and tie tightly in a knot leaving out as much air as possible. Put in pretty tins or containers for gift giving. Voila, Instant Gift, Instant Goodies! 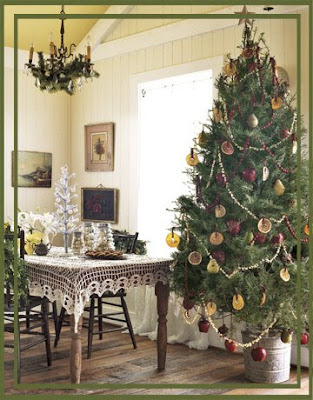 So when you are making your popcorn, cakes, pies or holiday goodness, why not put a tree where you can enjoy it? It helps put me in a festive mood. I hope it does the same for you too! Very cute... you made me hungry too. oh I remember that addictive stuff... Don't eat too much of it while you are making it. 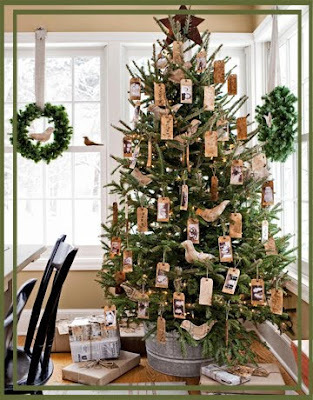 I think you should put a tree in your kitchen another activity for you to partake in. Thanks for the recipe, I'm trying to break a long-time popcorn habit, but I just have to give this one a whirl! 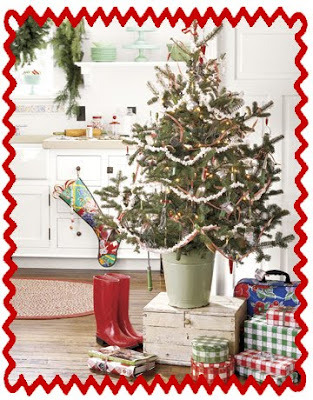 The kitchen tree is a great idea, something festive to look at while you're baking all those goodies! Enjoy the rest of your week Gail!